Atlanta–October 2015 – To enable C-store retailers to reach more lottery players in the forecourt, Linq3, creator of Play at the Pump technology, and NCR, global leader of consumer transaction technologies, worked together to make lottery play available at the fuel pump for participating NCR retailers. According to a NACS study, more than 73 percent of petroleum purchasers do not enter the convenience store. 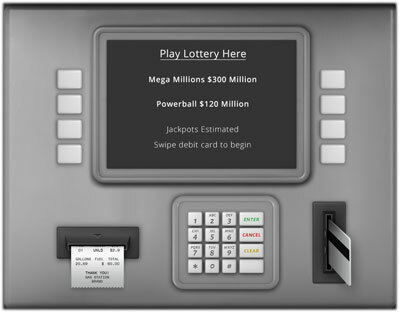 By integrating with Linq3’s fuel-pump lottery technology, NCR aims to help its retailers expand their reach and engage with Linq3 to enter this untapped market with a convenient way to play quick pick draw games at the forecourt. Taking convenience to another level, consumers who play at the pump using Linq3’s solution, receive a text message with the numbers played and receive win notifications on to their mobile phone. For winnings valued under $600, Linq3 provides an automatic redemption feature that is credited to the card used for purchase. Additionally, Linq3’s features such as play limits and age verification help ensure responsible play. “NCR has a long history of innovation that improves consumer experience while driving retailer revenue. We’ve combined that with Linq3’s proven ability to help lotteries reach more consumers through a very convenient purchase point readily available,” said Daniel Cage, Linq3 CEO. NCR will be showcasing Play at the Pump in booth 5126 at the 2015 NACS Show in Las Vegas, Oct. 11-14. Linq3 provides a fast, convenient and secure way to play lottery. Linq3’s innovative technology creates an immediate playing experience that engages the consumer right at the point of sale. For more information, please visit playatthepump.com. PointofSale.com does not sell products or services. Please visit the POS Retail software , POS Hardware , Credit Card Processing and POS Hospitality pages (see left side menu above) to find great POS products. Please let vendors know you’ve seen their products here. Thank you. For sponsorship information see the link below on the Footer menu.